Since the 1910s, the wider area was in the focus of the social building of the capital, initially mainly with barracks serving as makeshift housing. The Catholics living in the neighborhood first went to Mass to the gym of the Tomori street barrack school. The congregation was founded in 1923, and the gym was transformed into a permanent chapel. The St. Michael’s Church designed by Ernő Foerk, the architect of the Szeged Cathedral, was built a few years later, in 1929-30, directly next to the small housing estate which would soon become infamous under the name “Tripolis”. In 1933, the local ministry was elevated to the rank of parish. The church is not that pretty, but a good-proportioned, pleasing building with a brick revetment which has well resisted the vicissitudes of the past decades, and with some scattered decorative elements. The community center and the parish building next to it were finished in 1940 on the basis of Gáspár Fábián’s plans. The church is a popular landmark of this neighborhood which does not abund in beauty, its illuminated tower can be seen far from all directions. Which is good, because for example this is how my bike, like an old horse, finds back home in the evening when I’m tired. Look, here below, how nicely the children, all six, posture in the photo, they certainly did not think that they would appear only a tiny pinhead. If any of them is still living, he or she must be about eighty. The church in the year of its completition, in 1930. It can be clearly seen that on the tower, in the now empty square fields, there was a clockwork showing the precise time in all directions. in the last week, when, you see, it was still spring, that I have checked the last year’s tulips which we planted here and there as guerilla guardeners. And they grew out again! Ok, still it is not that spectacular, but there’s a supporting evidence from next to the Cella Trichora. Our efforts hitherto done for Budapest, the City of Tulips can be found here with a detailed documentation. However, last year we planted them too late, which is bad because they need cold to produce flowers, plus the bulb gains strength in the ground, I guess, filtrating the energy into itself in the form of minerals. 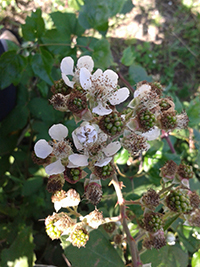 I mean it <i>would</i> gain strength, had we planted them at a good time, sometime between August and October. Actually, we planted them in early December, as far as I remember. Since all tulips know that they would be judged on their flowers, therefore they have compensated the late planting by growing very efficient stubby litle stems, as they could just afford, and they developed the flowers on the top of them. I’m curious whether this year they would be slim giants. Keep with us. The day after tomorrow, Wednesday morning we will talk to the gardener on behalf of the local government, we want to get money for the garden around the transformer at this year’s application. Earlier works here. If you have any idea or wish, feel free to write us now! The joint work is scheduled for the weekend of March 23-24. Hopefully the weather will be good, and maybe we will even get some help. More details soon! On Saturday civilians organized a protest demonstration on the Római Part (Roman Bank, named so after the ancient Roman settlement of Aquincum that extended here) in the north of Budapest, where the Danube enters the city. This tree-covered bank of the Danube is a natural floodplain for the annual flooding of the river, but in the last twenty years more and more investors have built houses and even hotels here illegally and with the tacit complicity of the district government. Now, as the head of this latter became Mayor of Budapest, he announced that a hundred million euro of public money will be poured in the building of a dam all along the Római for the protection of the same illegally built investments, which will lead to a total destroyment of this last natural river bank within the city. Those who do not know the Hungarian capital, will be probably surprised to notice that in a city with such a large river there is hardly any possibility to approach the coast. Even this last remnant is rather neglected, nevertheless, along with so many others, I really love the Római. Here you can walk down to the Danube, teach the kids to dap the stones, look for snail houses and shells, walk and swim the dog, go in kayak or canoe, meet friends, eat fried fish, dance in the music gardens, have a beer or a wine in a sun bed down at the coast, in the night watch the reflections of the illuminated boats, listen to the ensemble of Albert Márkos in the open restaurant Fellini, or mostly just watch the big, slow water. At once inside and outside the city, an easily available entertainment, even on a simple weekday evening. Lots of recreation facilities, with which such a powerful river enriches the inhabitants of the settlements along its coasts. Budapest has always taken a very poor advantage of what other cities, which manage their natural endowments in a smarter way, would just leap at. We say thanks to the several thousands of people who indicated with their presence that they do not want this popular natural coastline being transformed as designed by the Major’s office in the interest of the properties built on the floodplain. Update: Recent developments on the Protect the Future Association’s site – the Mayor, three days after (!) passing the decision on the building of the dam promised that the city would nevertheless have prepared the still missing impact studies. I don’t think we are wrong to believe that this step was also influenced by the inhabitants of Budapest called together by the civil organizations. Most people, if asked, would like a little bigger flat. A separate bedroom. A little more storage space. A walk-in closet. Separate rooms for the children. A balcony. A larger balcony. My apartment with its 35 square meters is an average small apartment in Hungary. In Hong Kong, one of the world’s most expensive real estate markets, where the average price per square meter is approximately ten thousand euros, the small apartment means something different. Sometimes it is also a daring dream to turn the bed across the apartment. The crowded conditions are somewhat reminiscent of the living distress of early 20th-century European cities, but also differ from them. While in the pictures of Hong Kong we often see absurdly narrow single cells, in Europe it was more characteristic that in rooms of normal size (that is, corresponding to local standards), much more people – up to fifteen or twenty – were crowned into than originally planned. In early 20th-century Budapest, for example, this congestion mainly extended to properties not provided with public services (mains water and sewerage fled). This situation, threatening with pandemic, and indeed from time to time causing epidemics, was answered by the authorities by prompt forced eviction, and on the long term by boosting social constructions. But a hundred years ago, these cities still had plenty of room to expand. Compartments similar to these drawer-sized rooms were designed in a part of the People’s Hostel at Aréna (Dózsa György) street, built in the 1910s in the frameworks of the Bárczy Program. These rooms were let out to workers who were single or left their families in the countryside. We can imagine what might have been the conditions, which were enhanced by this development. On the People’s Hostel, which in 2012 entered in the rank of the hundred year old houses, we want to write in the near future. written with a documentarist effort. The author writes about the history of the poor peasants of Heves county, particularly around the village of Szajla, traveling with the great migratory wave around 1900 to America, where they became factory workers. He pays careful attention to the slightest details. These are very poor families indeed, who, like many others from Eastern Europe, came to America with the definite purpose to collect as much money as possible with hard work of years, and then to return home and start a new existence with the capital collected. However, they excluded from the calculation what they could not include: the development of history and the personality-forming effect of time. The novel’s strength is precisely the self-confident changing of focuses, as he includes the history of the family into that of social groups and processes, treating together questions of sociology, sociography, mentality, lifestyle, industry and history of technology, very closely following the process of acculturation, now accelerating, now stalling, full of hopes and of disappointments, requiring continuous re-design, so difficult and time-consuming for the participants. As the text is very complex, it is perhaps not fair to highlight precisely the following moment, but the readers who live in Budapest, in the narrow area, will certainly know what conveys in it the feeling of recognition, that certain behaviors live on extremely massively, connecting generations. They did not go anywhere, no movie, no theater, they had no interest in culture. They did not keep up with the fashion. Once they had brought the more or less fancy clothes they brought with themselves, they only purchased one dress apart from the work clothes, and they wore it until it was abraded off them. They spared frantically, they only spent on the most necessary things. They spared everything from themselves, like the sickly misers. Except for the drink. They only slowly familiarized with the beer and whiskey. First they always required wine and fruit brandy. But there was no fruit brandy, and the wine was disproportionately expensive. But then they got addicted to the new drinks, and poured them into themselves, boozed them after the work, in the burd, but mainly in the szalón, the inn. There they usually got drunken and went into a fight with other nations, Italians and French, but mainly with each other. Or in the best case they quarreled, spatted up, disputed, wrangled. And this is how they went home after the closing hour, either individually or clinging together. And in top of all that, they also urinated a lot. Not before leaving, in the toilet of the inn, but on the way, in the street, publicly, shamelessly, as they were accustomed in Hungary. In the middle of the road, on the pavement, along the fences and walls, at the base of trees, wherever they felt the need, no matter whether there came someone, a woman or a man, in front of everybody. And in vain were they arrested and punished each time for public exposure, they considered this a nature’s law. The Americans were also quite horrified on the other freaks, but it was this barbarian open-air urination that they could digest the least. They probably much resembled the Irish, also looked down in the period as uneducated and trouble-makers. For a larger context of this detail of the novel on the cultural difference, check here (in the original Hungarian). the wax-soft childlike perception, which retains such small moments, easily ignored by the adults. Although the Pallas Great Encyclopedia, published at the turn of the 19th and 20th centuries, mentions somewhat pejoratively the organ-grinders, like who importune the public, and the great poet Dezső Kosztolányi in 1927 wrote about the disappearance of the anachronistic organ-grinders, still in the early sixties a number of people went about the Tahi Street with such a music-box mounted on a two-wheeled cart. The former children, today sixty and older, still happily remember the machine-musicians of the sixties. 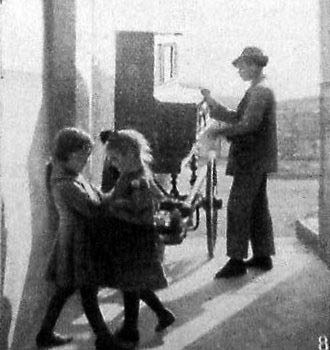 For many children in Angyalföld, the organ-grinder’s music was linked to the Sunday lunch. Others for the price of an ice cream helped to push the cart, or to pick up the fifty-filler coins wrapped in newspaper, thrown from the courtyard windows. They also remember the punch cards, too, and they say that the organ-grinder did not buy, but he himself made them. This is an interesting element of the story, because, as far as we know, this type of barrel piano does not use any punch card. Street music machines have two major types: barrel piano, what we see in the picture, and barrel organ. The latter name is often used for both types. However, in the barrel piano the keys providing the sounds are operated by a cylinder, onto which the melody is coded by nails, similarly to the little music boxes still available in game stores. Of course, the cylinder in the barrel piano can be up to forty times greater, since the length of the piece of music which can be played depends on the diameter. In the case of the barrel piano, the cylinder operates a piano structure. This plebeian music machine also has an aristocratic brother, the player piano or pianola. At first glance it is a traditional instrument, with keyboard and foot pedals. In this they really use codes set on punch cards, which gives way to a much more finely differentiated playback. 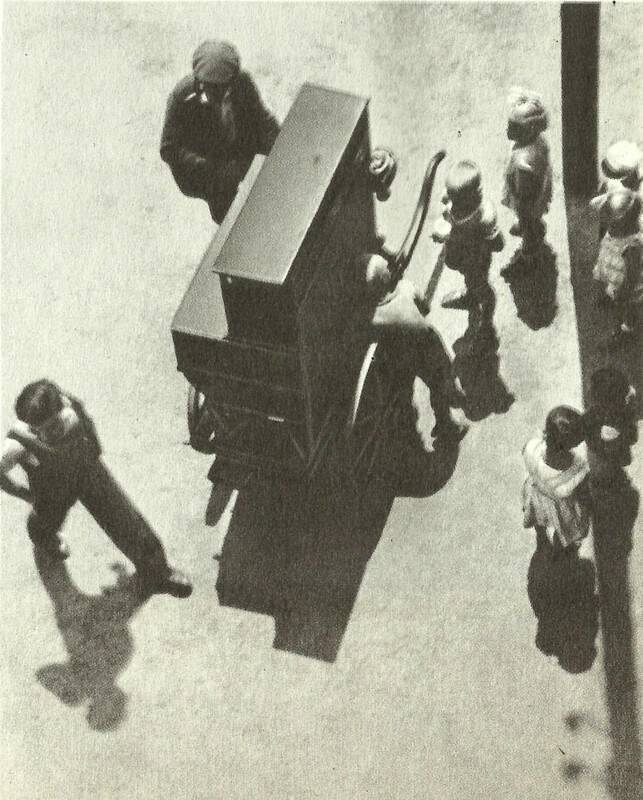 The player piano was also one of the first techniques of music recording, which could record the actual performance of a pianist, thus the result was not the machine-replay of a sterile melody line, but of a true artistic interpretation. Such recordings were made, among others, by Scott Joplin, Béla Bartók, or the young Artur Rubinstein. It is therefore a mystery how the punch card rolls got into the above childhood memories. Perhaps there was another instrument in the neighborhood which worked on that principle, but it is also possible that the old man simply tricked the young girls. I don’t know. Checking thoroughly the following photo from the 1930s, one thinks that perhaps the same music-machine – just some decades younger – features here in the background. Perhaps the man is also the same in the two pictures? And if it is the same instrument, then it is also in the following picture, taken in the thirties? The poor quality and the different perspective make the comparison complicated. The turned feet are perhaps obscured by a scaffolded support, but otherwise the instruments appear similar. However, organ-grinding was typically an one-man-enterprise, and the man with a hat and the one with a worker’s cap are perhaps not identical. Who knows it for sure today? According to our informants, taken from the the neighboring flat, at Attila street 150. But there were also other ambulant performers in the district along the axis of the Váci Street. In the Tripolisz they even remember a singing beggar, such an old man that his voice did not reach the windows. Nevertheless, he also received his emoluments. In addition to the barrel organ peddlers – who often were disabled soldiers or people in need of an easy physical work for other reasons – there was also an important rival group of backyard music service: the Gypsies. They were mainly young people, who linked up the daily practicing with earning bread, going about with their violins, and playing popular hits or Hungarian songs. Angyalföld was the cradle of a good many famous Gypsy musicians, as we will tell about them in a later post. 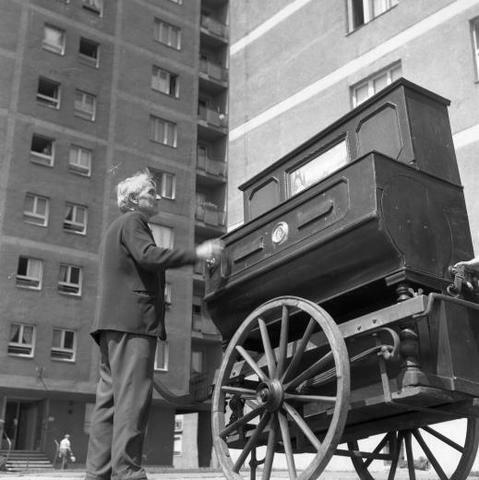 There were also two other old men, Uncle Pista and his brother-in-law or brother… maybe they are in Iván Vydareny’s photos taken in 1960 in Angyalföld, pushing their music-machine in the Visegrádi and Gogol Streets. And the player piano which accompanied our tour in Angyalföld, unexpectedly shows up again for a last time to tell goodbye, purchased for the scenery of the 1969 film version of Ferenc Molnár’s famous The Boys of Paul Street. Every mouse loves cheese. Radio game, 1980.
fönt van a fényes titok. Catch the star on the water! the bright secret is up there.